I like nuts as a snack but I like them even better when there’s chocolate involved. I will always choose the chocolate bar with nuts mixed in, I always put nuts in my chocolate chip cookies, and rarely do I have a trail mix without a little dark chocolate mixed in. 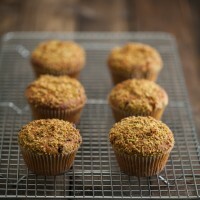 So, it should come as no surprise that these are a favorite muffin of mine. I didn’t like pistachios for the longest time but once I started, they quickly became my favorite. 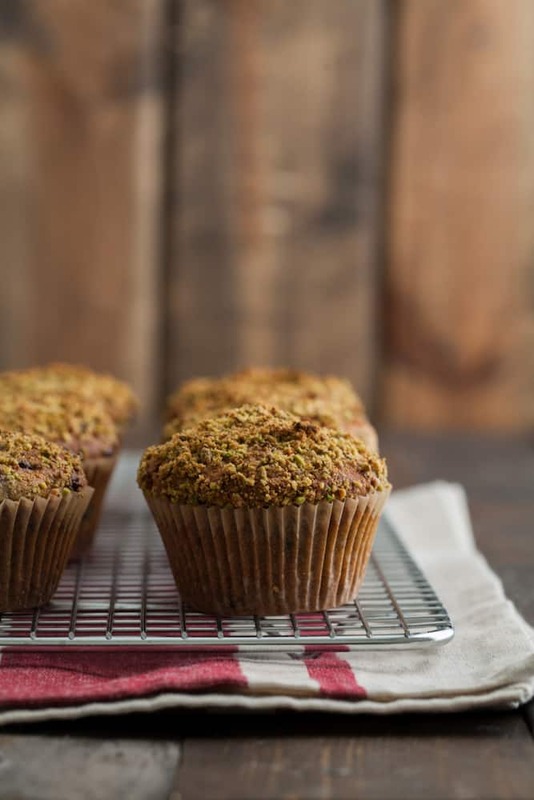 These pistachio muffins are the end result of finding a way to combine chocolate with pistachios in a slightly bigger mid-morning snack (for the occasion I’m craving something pastry-like). Quick note, If you can’t buy roasted/no salt/shelled pistachios at the store, you can always buy a bag online (I’m finding when living in a smaller area, online food shopping is wonderful). Preheat oven to 350˚ F and line a muffin tin with 12 liners. To make pistachio meal, pulse pistachios in a food processor until broken down into meal. Do not run for a long time or pistachio meal will turn into pistachio butter. In a bowl, combine 1 1/2 cups ground pistachios (reserving 1/4 cup for later use), wheat flour, baking powder, baking soda, and salt. In a separate bowl, whisk eggs and add in milk, oil, and honey. Pour wet ingredients into dry and ingredients and stir until barely combined. Fold in chocolate chips. Divide batter among 12 muffins. Sprinkle with remaining ground pistachio meal. Bake for 15-18 minutes. Top should be golden brown and muffin should spring back lightly when touched. Extra muffins store well in the freezer. This recipe can also be made into 6 jumbo muffins by adding more time to baking. These muffins can be fun to play around with. I’ll swap the pistachios for hazelnut or almond meal, ditch the chocolate chips, or even make gluten-free. I always come back to the pistachio/chocolate pairing though- so good! Gluten-Free: I like to make my own gluten-free flour blend that is 2/3rds millet, sorghum, and oat flour mixed with 1/3rd potato starch and arrowroot. 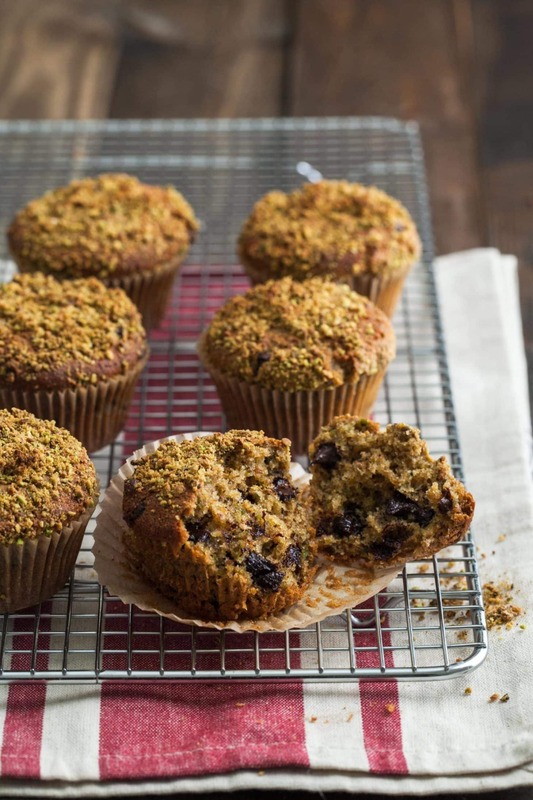 Without Chocolate: Obviously these pistachio muffins would be quite a bite healthier without the chocolate and would well without. Or, swap in dried fruit to use in place of the chocolate. Half-Batched: Not really a variation but I know pistachios can get expensive in large quantities. I will make a half-batch of these muffins and freeze to eat as a treat or I’ll make mini-muffins (same instructions as above but drop the baking time slightly. I don’t use nut flours that often but when I do, I remember to add them to a baked good, I remember how amazing it can be. If you want to learn more about making your own nut flours/meals- I have an entire chapter in The Homemade Flour Cookbook. That looks so delightful and gooey! Would olive oil work well? It might- I usually stay away from baking with olive oil unless I want it to be a key flavor. This is one of my favorite snacks too — with dried cranberries added to the mix! I get my pistachio nutmeats (roasted/unsalted!) at Trader Joe’s. Will have to utilize the on-line shopping when I move out to Fort Collins in a few months (no TJ’s in town!). YUM! Chocolate and pistachios are an awesome combo! love love love chocolate chips and pistachios together! These contain two of my favourite flavours in the whole world! I’ve been making protein balls (brown rice protein, maple syrup peanut butter) and rolling them in cocoa nibs and chopped pistachios but these look ten times better! I have been snacking on and cooking with pistachios like they are going out of style. I must try these muffins! You and me both! I can’t get enough! Erin, these look amazing! Pistacios and chocolate is a great combo. I’m assuming we need to add the wheat flour in with the dry ingredients? Ah- thanks for the catch. Updated! Pistachio and chocolate is such a perfect combination and these muffins look delicious. Love the idea of those ground pistachios through the batter too! Looks great! I love pistachios and this seems like a wonderful combination. Somehow I’ve never combined pistachios and chocolate. These muffins look so tasty! Pistachios and chocolate?! Two of my favorite ingredients, ever! Mmmm maybe I’ll start taking pistachios and choc chips to work as my midday snack instead of almonds. Or I’ll just make these muffins. Yum! Your photography is always so wonderful. Pistachios and chocolate are like two peas in a pod. Perfect together. These sound like a great breakfast option. Have you tried this in a loaf? I have not but I think it would be fine! I never tried to bake with pistachios but I will definitely try it! Your muffins look amazingly delicious!! 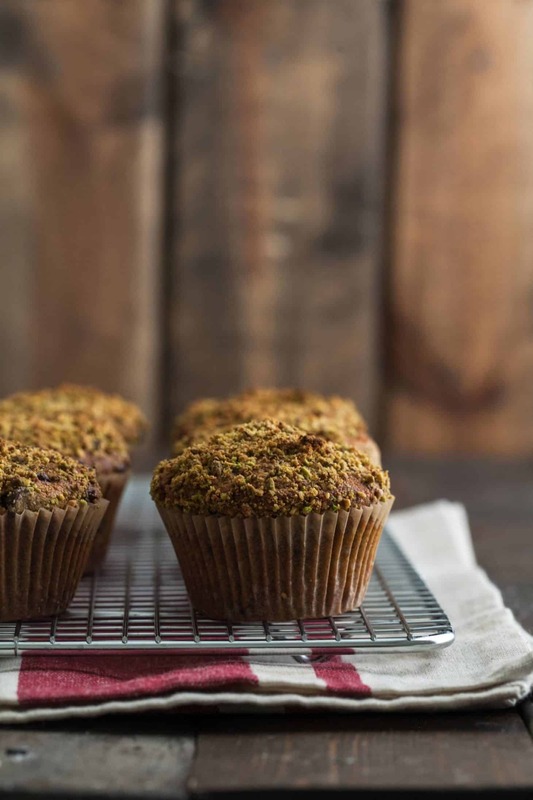 Pistachios and chocolate sounds like a match made in heaven–especially combined in a whole wheat muffin! I love that you used coconut oil, too. stupid question: while making the pistachio meal… are the pistachios still shelled? Shelled- usually raw or roasted without salt. Hi. I just made these! Kids loved them. Only change was I used regular wheat flour (I did not have pastry flour) and buttermilk (needed to use it up). Thanks for the recipe. Fabulous! don’t halve the recipe cos it tasted absolutely gorgeous the following day! Amazing flavor – perfect amount of sweetness and beautiful pistachio flavor with a “crumbly” feel. Substituted cranberries in for chocolate to soften the intensity. I love using pistachios rather than so much flour. And with the chocolate chips, so delicious! I used coconut oil, but the flavor didn’t dominate, which was nice. Thank you!